November 28th in Wordpress Tips by Wordpress Jedi . I don’t know about you, but coming up with new ideas for my blogs has always been a challenge for me. I remember my first year of blogging very well. I was so excited, and I was having all these crazy ideas for my WordPress blog. But then, I started running on empty idea tank. I started rehashing stories and looking at them from a different angle. Whoever said blogging was easy! The truth is, blogging is not easy, and it was never meant to be. It’s true that a lot of folks got away with talking about their lunch experiences a few years ago, but unless you have good solid content to share with folks, you are not just wasting your time. 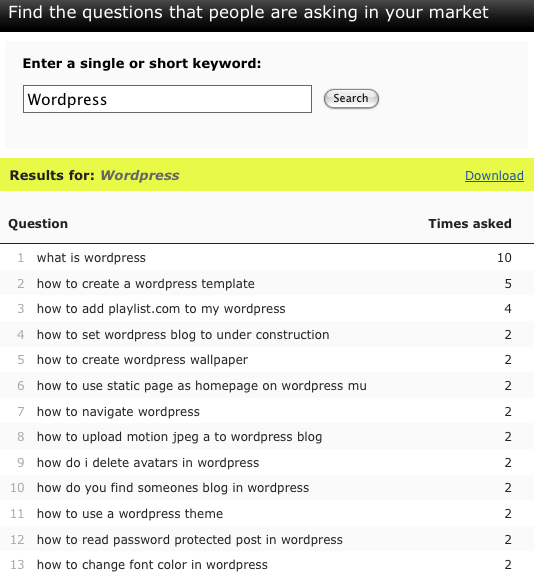 WordTracker is a blogger’s best friend. The keyword research service has been around for so long, and has helped many blog their way to success. What WordTracker does is it allows you to use a set of keywords and dig deeper to find small niches and long-tail searches. Long-tail blogging is an awesome way to target small niches and get folks to follow your blog. Some of these questions may sound pretty silly, but believe it or not a lot of folks don’t know these things. You can apply this to any niche. You may only get a few ideas for this tool, but you can certainly get enough to come up with your own ideas. And let’s not forget that you should have a set of keywords ready to dig deeper and find new ideas. Folks won’t stop asking questions and looking for answers, and you shouldn’t stop trying reading their minds either!